Bridges to Music is Peninsula Symphony’s education and outreach program, touching the lives of thousands of people each year by bringing the joy and magic of live music into schools, libraries, senior facilities, public and private events, and more. Whether it’s a fun and interactive assembly at a local elementary school, a free concert in the park for hundreds of patrons, the chance to be coached by a rising superstar instrumentalist, or the opportunity to go “behind the scenes” as Maestro Klein and our players create orchestral magic, we want to make music available to the community however and whenever we can. Every teacher and school administrator wants to offer their students exciting, interactive and educational assemblies by fun and engaging professionals that are education-minded and connect ideas with current curriculum. 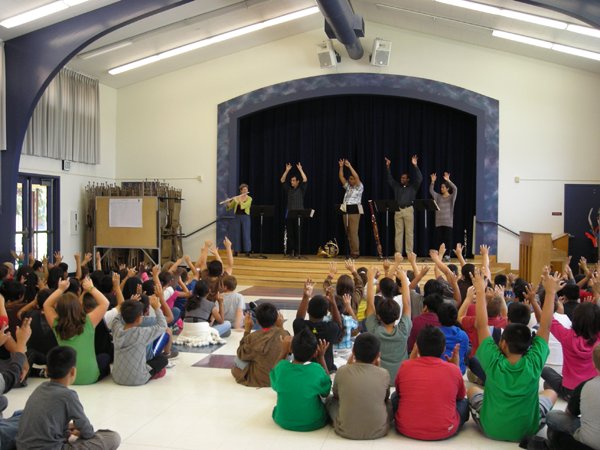 Students throughout the Bay Area can experience live, in-school music presentations as PSO brings professional artists and ensembles into elementary schools. And thanks to the generosity of our program sponsors, these assemblies are always free of charge. This year Peninsula Symphony is excited to expand its partnership with Quinteto Latino! 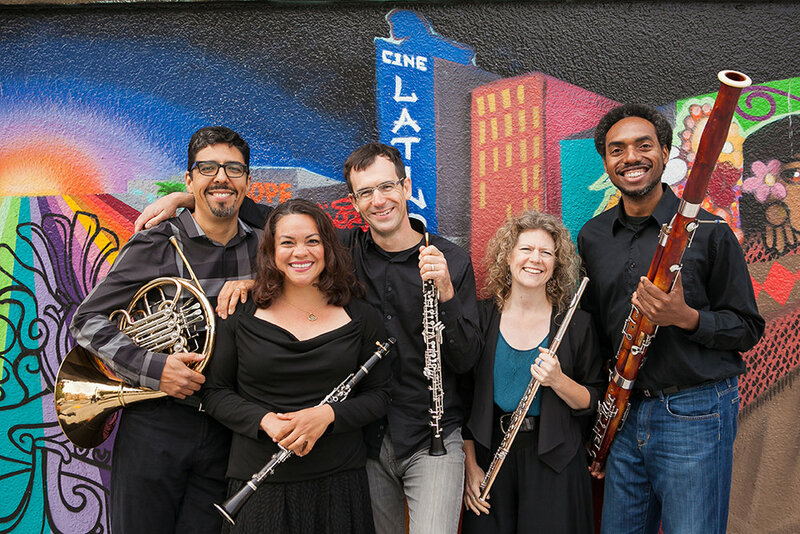 Quinteto Latino is a San Francisco based wind quintet that specializes in classical music by Latino composers through performance and advocacy, aiming to expand the boundaries of a classical music tradition commonly perceived as predominantly Euro-American. Through varied and innovative work in venues both traditional and non-traditional, they strive to make that music available, relevant, and inspiring to audiences across cultural, class, and ethnic lines. Their teaching artists work to create educational programs which are fun, interactive, and appropriately tailored for age groups from K-8 and for English Language Learners. Founded in 2012, the trio presented its first show, Tribal Beginnings in Mountain View, CA exploring all the various combinations possible on the flute, horn, piano and percussion while crafting an out-of-the-box experience for their audience. Their subsequent shows, Shall we Dance?, On the Fly – Live Musical Improv, and Storybook Mosaics have seen them collaborate with dancers, filmmakers, and even a professional pinball player. They believe anything can be musical and artistic. And that anything is possible. Chin-Fei Chan holds a Doctor of Musical Arts degree in flute performance from the University of Illinois at Urbana-Champaign. She performs actively on both the flute and the piano as a soloist, chamber musician and piano accompanist within the U.S. and Asia. Percussionist James Kassis has worked as a freelance musician and teacher in the Bay Area since 1987. Horn Player and composer Daniel Wood has performed over 1000 concerts and recorded 4 albums with his horn quartet, Quadre, since 1998.